Cape May Zoo Red Panda Finds Love in D.C.
WASHINGTON — A male from this county traveled to our nation’s capital to find a mate and according to early reports, he’s been successful. 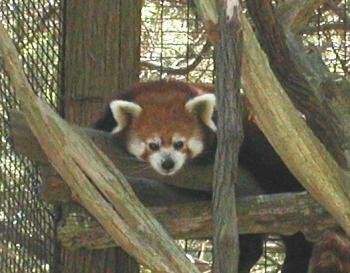 Tate, a male red panda who lived at the Cape May County Zoo for the past several years was sent to the Smithsonian’s National Zoo to meet a female red panda there and hopefully make more little red pandas in the process. According to Dr. Alexander Ernst, a veteranarian at this county’s zoo, Tate’s trip was part of the Association of Zoos and Aquariums Species Survival Plan, a sort of animal dating service that matches endangered and threatened animals. “It’s a program that happens every day in accredited zoos to manage the population of animals in captivity,” Ernst told the Herald. He said the program’s goal is to have a strong, healthy, genetically diverse captive population in case animals needed to be reintroduced into the wild. Before programs such as this, animals were inbred, Ernst said, causing weakness in the subsequent generations. Tate was sent to the National Zoo about a month ago and probably spent a few weeks in quarantine, Ernst said. According to a report from Washington’s ABC News Channel 7, after a day’s acclimation to the exhibit, Tate was introduced to one-and-a-half year-old Shama and immediately exhibited breeding behavior. “That’s great news,” Ernst said upon hearing the news. Because of loss in their native Asia habitats, red pandas are endangered with an estimated 2,500 adult pandas in existence. This entry was posted on Friday, April 24th, 2009 at 6:51 pm	and is filed under Uncategorized. You can follow any responses to this entry through the RSS 2.0 feed. Both comments and pings are currently closed.